New items in Local History collection! 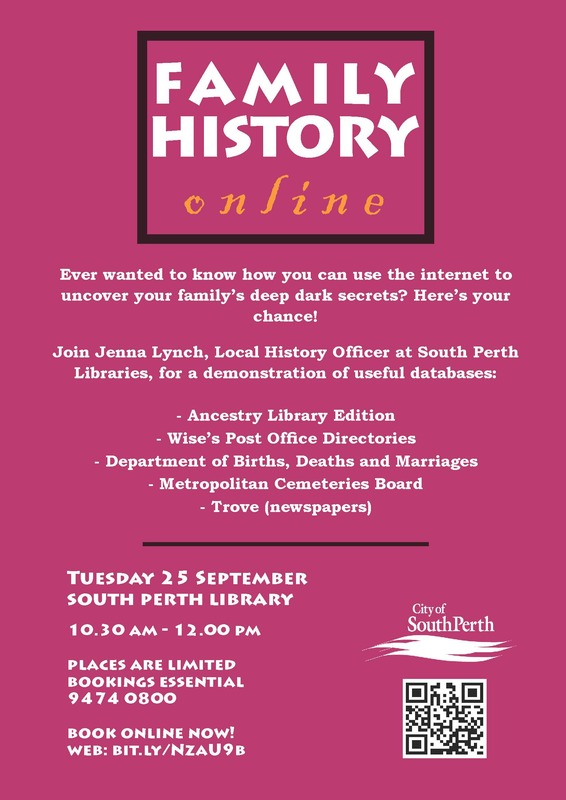 If you missed the memo – you can borrow items that are in the general Local History Collection (located at South Perth Library). You can loan three items at one time, for a seven-day period. You aren’t able to renew these items however simply bring them back into South Perth or Manning Library so we can check on their health and we will happily re-issue them to you (given that there are no reserves on them of course!). Savagery on the Swan River Settlement : the aboriginal murder cycle and the 1839 killing of Sarah Cook by Peter J. Bridge. Talking ’bout my generation : 2012 City of South Perth Local History Awards : the award winners collection. Bibliography of books, articles and pamphlets dealing with Western Australia, issued since its discovery in 1616 by Francis G. Steere. Black water prawning : drag netting in the Swan River by Will Smithwick, Kevin Reid, Rana Ensor. Canning Bridge now permanently on the State Heritage list! Did you know that the Canning Bridge you see today is not the original structure? It was first constructed in 1849 and has been through many repairs and has had additional structural features attached. Oodles of history is attached to the site too, ranging from convict labour, developments in transport, environmental disasters and social connections. The Canning Bridge moved from interim to permanent listing on the State Heritage list earlier this year. Hooray! Check out the State Heritage Office’s magazine Heritage Matters for an article about the changed listing. Want to know more about the history of Canning Bridge? Check out the listing for the bridge on the State Heritage Office website and the entry in the City of South Perth Municipal Heritage Inventory.